Every Sunday evening Liliana’s Restaurant in Fitchburg welcomes families, giving parents the opportunity to kick back, while their children (under age 12) eat free. This Sunday night there is an added bonus. I will be there, reading my book to children ages 0-7. If you live in the Madison, WI area or will be there for any reason on Sunday, Dec. 4, stop by anytime after 5 p.m. with your children. I look forward to meeting you, exploring ideas with your children, and signing books as well. 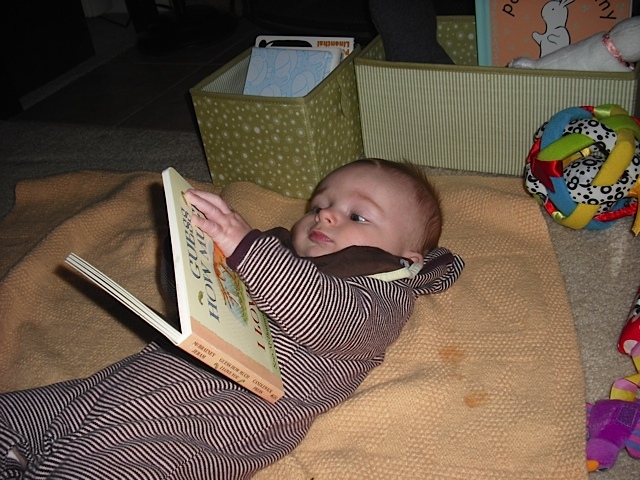 Start your child off reading like this little guy. A world of wonder is the result. For more information on Liliana’s go to http://www.lilianasrestaurant.com/. And don’t forget – every Sunday is Family Night, and kids eat free.